can you post the diagram you had for your procharged setup? i don't think it worked in the other thread. where'd u get the alternator pulley from? Speed Mafia? so on your setup that was the only thing you changed on the belt side right? yup smp.. essentially what it is.. is a machined down stock alternator pulley you could definitely pick one up form him . gave hunter my 2.9 pulley to try out. looks like the furthest you can go on a stock lsj belt is a 3" pulley. I finished w/ my I.M. gasket Casey; I'll bring you back your belt tool this week. "A serp belt is labled with 4 digits and "K" number. The "K" is your number of ribs. The first 3 numbers are "inches long" and the 4th digit is for tenths of an inch. For example a 1025K6 is a belt that is 102 & 5/10ths inches long. So your belt should be a 0770K6 or K60770 depending if it is Goodyear or Gates. But there could be different types of labeling. As long as you have those numbers you should be able to get them at any decent auto parts store." After looking around this number system works, just not always in the order presented above and not always with a "K". Anyways, stock lsj belt is a 060702 , 6 rib @ 70.2 inches. I've looked around online cross referencing belt part numbers and cannot find any belts in a 5 rib that are within an inch of 70.2. If anyone else has better luck, please post where you find it because I want one too! 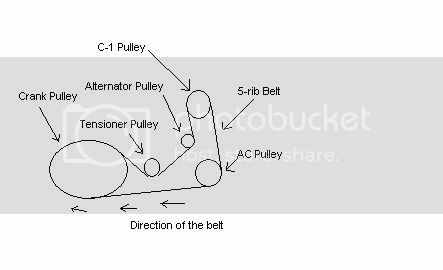 but the M62 pulley would be in a different position than your C1 unit so wouldn't that likely change the belt length? hunter, ur going to run 2.9 on stock internals? im interested in what pulley i can get away with before rebuilding. been running the 2.9 for a couple weeks now..maybe 3 weeks. no issues at all. saw a good 10-15hp increase from the 3.0"
ok wow. so then no worry if i drop to the stage 2 with injectors and a tune then. should be fine. my initial install was with a 3.0" pulley, which is the stg II pulley anyway. course at the end of the day, airflow doesnt blow up parts, HP does. heat and cyl pressure destroy pistons on our car. is the fact that my ion is a manual going to change anything for this? Is there still anyone that you can pay like 2 g's to do a full piece together and install..? There used to be that one guy.. If not, it's cool, but paying a flat price would be far easier than piecing every single part together.. However, piecing it together allows you to use better and aftermarket parts though too.. Stage kits..
the only person im aware of who was doing that only did it for one person because he had the complete setup. he was seling it and offering a free install to the buyer. he didnt have multiple setups or anything. The closest to a complete kit would be the kit made for the cavalier. that will have MOST of what you need.